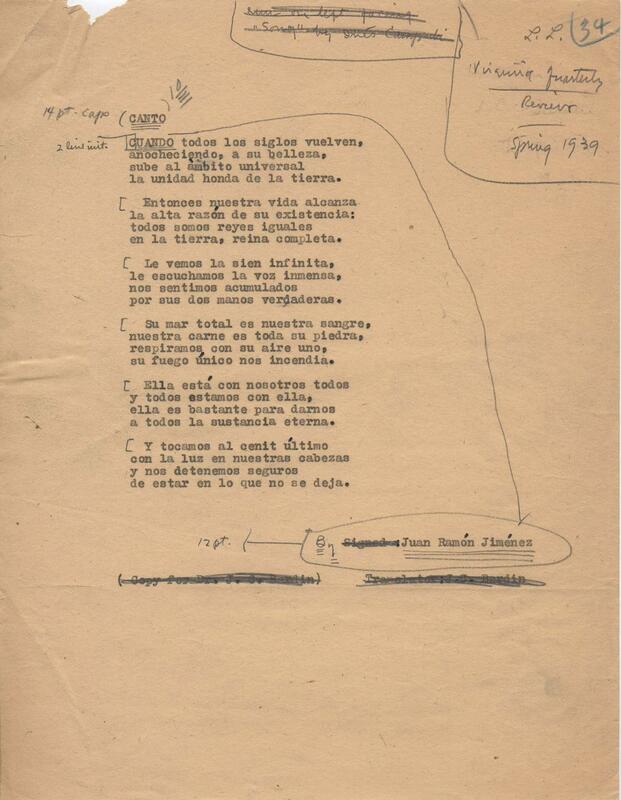 In our Spring 1939 issue, Juan Ramón Jiménez published his poem “Canto” in Spanish, with an accompanying English translation by Inés Camprubí. A native of Spain, Jiménez fled the country when its bloody civil war broke out in 1936, and two years later he and his wife were hosted in Charlottesville by Virginia Quarterly Review Editor Lawrence Lee. Translated as “Song,” the poem begins: “When all the centuries return, / night falling, to their beauty, / to the ends of the universe rises / the deep oneness of the earth.” Writing in exile for decades, Jiménez established an international audience and was awarded the Nobel Prize in Literature in 1956. His correspondence and manuscript are in the VQR archives in the Albert and Shirley Small Special Collections Library at the University of Virginia.